Posted on February 9, 2018 at 5:47 am. Attention 8th graders! Today is the day — Your high school Course Request Forms are DUE. There are a ton of fun, interesting, and challenging classes to choose from at Yorktown. But if you miss the deadline, you may not get the one you want. Make sure they’re completed and returned to your counselor before the final bell this afternoon. So stop procrastinating, and turn-in your CRF!! See Mr. Tuttle with any questions. The Boys Cohort will be meeting next TUESDAY during ASP 1 in room 233. It’s an opportunity for Black and Latino students to meet new people, and become LEADERS in our community. Allies are welcome, too! See Mr. Hicks, Mr. Eason or Mr. Valdez with any questions. It’s time to share the love, Williamsburg! The WMS Kindness Club is promoting an important campaign for the month of February: “Have a Heart.” Animal shelters across America house THOUSANDS of homeless pets — but often can’t provide even basic warmth and comfort. But you can help! All this month, the Kindness Club will be collecting new or gently used towels and blankets for donation. Collection bins are located in the main lobby by the library. So “have a heart” and “do your part” to support our furry friends in need! And now it’s time for our newest segment: Champions of Change! Honoring the innovative, courageous, dedicated Americans who helped to shape the world we live in. 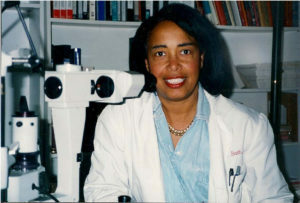 Meet Dr. Patricia Bath, who in 1986 invented the Laserphaco Probe — a surgical tool used to correct cataracts, a serious eye condition that can lead to blindness. This medical device is now used around the world, restoring sight to MILLIONS of people. Plus, she’s a local girl! 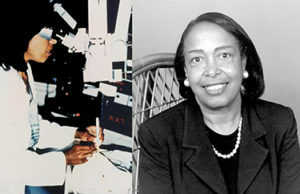 Dr. Bath attended medical school at Howard University in Washington, DC. Her efforts truly make her a Champion of Change! And finally today: we’re a month into the new year. Are you being all you can be? Student-Reporter Annabel P. wants to know YOUR resolution — for making 2018 your best year yet. That’s all for now, but stay tuned for CNN 10 on WOLF-TV!